Ion Hamilton Benn was born 1863, and educated at the Merchant Taylors School. He became partner in the firm of Price and Pierce, London and Glasgow, and Director of Price Bros. and Co., Ltd., Quebec, Canada. He comes of an old Cumberland family which established itself in the North of Ireland about the middle of the eighteenth century. After leaving school, and becoming associated with commerce, Mr. Benn travelled very exten­sively on the Continent, and in America and Canada. He was Mayor of Greenwich in the Coronation year, and has represented that borough on the Metropolitan Water Board since its formation in 1903. In 1904 he was elected Chairman of the Greenwich Conservative Club. He contested Greenwich in 1906 as Conserva­tive Tariff Reform candidate. Betty, Yawl, 92 tons. Mr. Ion Hamilton Benn. An enthusi­astic yachtsman, Mr. Benn owns the 92-ton yawl Betty, which was designed by Mr. Arthur Payne, and built by Hansen of Cowes. She is steel-framed, and has great accommoda­tion. Betty is, moreover, a very successful racing boat. 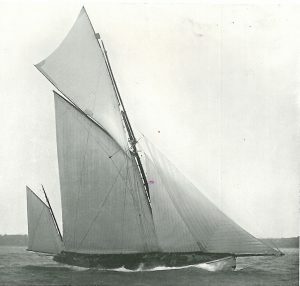 In 1905 she won a Royal Yacht Squadron prize, and first and second prizes at the Ostend Regatta, second prize at Torquay Regatta, and first prize at the Royal Dart Yacht Club Regatta. In 1906 she won the German Emperor’s Cup in the Dover-Heligoland race. He is a member of the Yacht Racing Association. Clubs: Royal Thames, Royal Corinthian, Royal Norfolk and Suffolk, Cinque Ports, Junior Carlton Club.